Zombies, plants, and a little father/son time can make for a very enlightening experience. Unless you only ever hang out with Borg drones, there's bound to have been a time when you loved a game that your friend hated, or vice versa. It's a bizarre feeling, often making you wonder how the other person could have gotten things so completely wrong. Of course, despite this feeling, you can often both be right, and in Issue 294 of The Escapist, Steve Butts says that nothing taught him this like playing videogames with his five year old son. 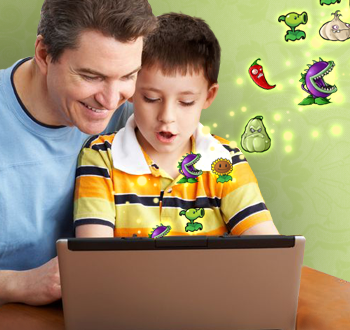 Let's take one of his favorite games, Plants vs. Zombies, as an example. As a gamer, I see this game primarily as a challenge to be overcome and the form, while hilariously captivating, is merely the icing on the cake ... My son looks at it completely differently. For him, the game is about the form. He wants to see the zombies get eaten and the actual challenge behind it all is entirely incidental ... When a zombie finally gets into our house, he turns to me with an amused expression as if to say, "Can you believe the bad luck we just had? I bet we can beat 'em next time!" Things are much more interesting when he takes control of the game himself. Here, he's clearly motivated more by aesthetics than by tactics. He won't plant sunflowers, because to him they're just not very interesting. They bounce around, and sometimes generate glowing balls. Boring. He'd rather just plant an entire garden of Chompers and watch as they devour wave after wave of shambling zombies. Or use a Jalapeno to clear a lane that only has one zombie in it. He almost always loses in the end, and sometimes quite spectacularly, but I can't shake this feeling that he's somehow found a hidden source of fun in the game, a fun that I can only experience vicariously. Thanks to his son, Butts was able to see a game that he enjoyed from a totally different perspective, a feat that not everyone can boast. You can read more about it in his article, "Anything But Child's Play."